Seth Grahame-Smith seems to have made a name for himself by combining timeless pieces of history or literature with whatever seems to be popular at the time. In 2010, and in its subsequent Tim Burton-produced adaptation two years later, he presented an alternate timeline for Abraham Lincoln and his days spent tracking down and killing vampire in, what else, Abraham Lincoln: Vampire Hunter. But arguably his most infamous work, now a feature film, is Pride and Prejudice and Zombies (take a wild guess as to what he’s combining this time), something that has taken years of development to even get itself off the ground, going through various directors like David O. Russell and Craig Gillespie, and even stars like Natalie Portman (who is still listed as a producer). Clearly, the project was SO worthy of a big-screen adaptation that it simply HAD to be made no matter what the circumstances – and the final product indicates that those circumstances were that the script so desperately wanted to be one of the things listed in the title without paying much attention to the other. The most surprising thing about this film, now written and directed by Burr Steers (17 Again), is that the entire inclusion of zombies in the first place is completely incidental, not even figuring its way into the plot in any real way; you are in fact paying to just see a new version of Pride and Prejudice, which just so happens to have zombies for no real reason. Everything about Jane Austen’s classic novel, from the plot – which, if you’re not familiar, sees young woman Elizabeth Bennett (Lily James) manoeuvre through her mannered culture while being courted by the arrogant Mr. Darcy (Sam Riley) – to verbatim lines of dialogue, is on display here, and is played completely 100% straight. It’s as though Steers was so bent on just making a proper version of the novel that he forgot the reason why this project was being made in the first place; whenever the zombie element does come into play, whether it’s various scenes of sword-swinging or even just casually dropping the word “zombie” into normal conversation, it’s really jarring and out-of-place (and yes, we understand that was the whole point of Grahame-Smith’s novel to begin with, but in a film adaptation that plays the Austen angle as straight as it does, it’s even more noticeable than not). People tend to give Abraham Lincoln: Vampire Hunter a lot of hate – we still stand by our opinion that it’s a dumb-but-entertainingly-dumb guilty pleasure of ours – but at least it took as much advantage of its genre mash-up as it could; Pride and Prejudice and Zombies unfortunately cannot be thought of as doing the same, with the zombies all but shoved to the background so that the film can concentrate on doing the one element it thinks it needs to do. They’re gone for so long at times that you actually forget there were zombies in this particular version of the story at all, and when they do return it’s almost out of nowhere and takes you completely by surprise. Even when they are on screen, the zombies themselves look fairly impressive (the make-up work is rather strong) but so little attention is payed to them that we can’t absorb their presence for enough time to really let them sink in, especially when they’re subject to violence that is clearly edited down to remove the gore and body horror so that it can avoid a 15 certificate in favour of a younger audience. If the film is instead trying to be a straightforward version of Pride and Prejudice, then it’s only a mildly-successful one; the costumes and sets are honestly rather nice, James makes for a fine Elizabeth, but Riley as Darcy feels somewhat miscast (maybe it’s his naturally-raspy voice, but he does not seem like the right fit for a character like Darcy), and the basic plot beats play out like Pride and Prejudice For Dummies. Matt Smith, however, is a consistent source of entertainment as the foppish Mr. Collins, livening things up whenever he’s on screen; but his is a fairly limited role and his presence is sorely missed. Overall, the entire zombie gimmick comes off as a cynical attempt to draw attention to what is otherwise a straightforward Pride and Prejudice adaptation, and not even a great one at that. If you want a Grahame-Smith mish-mash that actually works, we recommend Abraham Lincoln: Vampire Hunter instead; at least it knows to be both parts of the title. 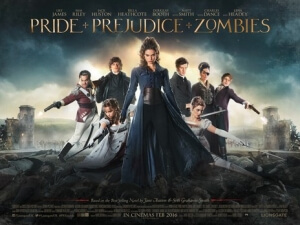 Pride and Prejudice and Zombies seems far too focused on being a straightforward, and intermittently successful, adaptation of Pride and Prejudice that it all but forgets to expand on the zombie element that it’s selling, making this a rather cynical ploy to draw attention to the umpteenth version of Jane Austen’s novel.